Almost all questions have right answers and most of us spend our lives to trying to find them. Sometimes it’s good to take a breather from this quest and, instead, try to find the wrong answer. It sounds simple enough, right? All questions have a right answer and plenty of wrong ones. But in SetBreaker the wrong one is right! In SetBreaker, you have to answer questions with the wrong answer to score. The more questions you answer in the limited time available, the higher your score. So how does it work? Each question is made up of four answers, out of which, usually, only three will be the right ones. Your task is to choose to wrong one to advance to the next question. Think of the questions like word association games. Three out of four words will belong in the same category, while the fourth is the odd one out - the set breaker. Check the category hint at the top of the screen on the left and look at all the four answers, then touch the one that doesn’t fit together with the other three in the hint category. Sometimes though, all the answers will fit in that category - all of them will be the right one. Other times, none of them will. Choose ALL MATCH or NO MATCH in these cases. Be quick about it though. 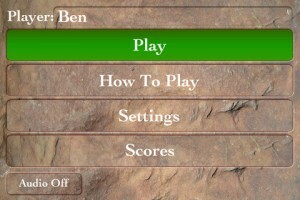 You only have three minutes by default to answer as many questions as possible and get a high score. You can extend the time in the Settings to have a whole of 5 minutes to answer questions, or choose the Expert mode and play without a time limit. In this case, missing one question will end the game. 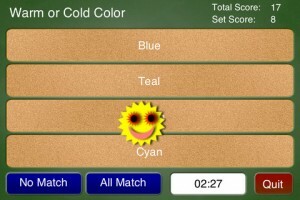 The more questions you answer in a row, the higher your combo, and the higher your score will get. 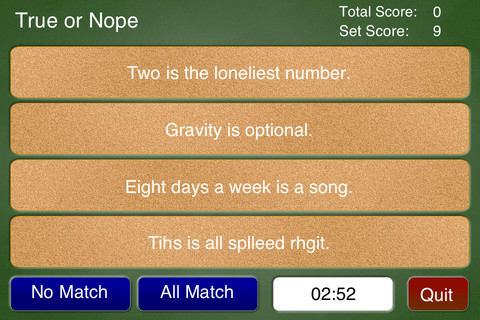 Combos come with every three correctly answered questions (3, 6, 9). You can also get another hint to the same question if you’re stuck by tapping on the initial hint the game gave you. The score will be lower if you get the question right after this second hint though. If you’re still stuck, you can skip the question by shaking your iPhone. This is particularly important if you want to maintain your combo you’ve built up till you got stuck. So if you answer two questions in a row right and you aren’t sure of the third, instead of giving a wrong answer just to get another question and ruining your combo, shake your device. Neat trick! You can turn on Arcade mode and have the game display small distractions on the screen while you’re answering questions. These “distractions” include objects like a snake, a smiley face, a ghost, all items tappable. If you tap them, you get bonus points. Be careful though, if you tap them as they’re disappearing from the screen, you might hit the wrong answer. I can’t say I particularly enjoyed the Arcade mode. I’m glad actually that the game doesn’t come with this mode as the default or worse, built in. Some of the questions are tough enough and you don’t need additional distractions, trust me. 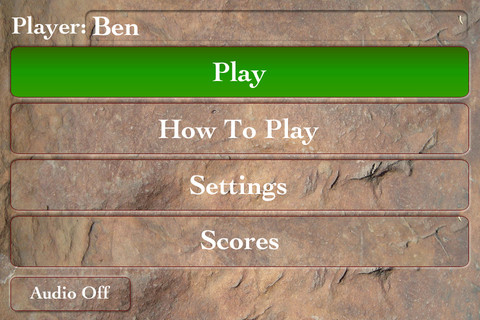 On the same note, the graphics for the app are as basic as they come. Plain colors come together with plain fonts, no special effects whatsoever. You can choose between several game skins - themes - but I can’t say that choosing one over another will improve the overall feel of the game. At times, SetBreaker seems like it’s a game that can prepare you for the SAT. It requires attention, a fast eye, plenty of general knowledge and, at times, one hell of a vocabulary. But we shouldn’t look at it from this point of view. SetBreaker remains a fun game for both your brain and you. What do you think of SetBreaker ? Scroll down for our comment section and let us know! Can You Be The Next Stack King?